I had already tried a number of mineral makeup brands before I settled on Everyday Minerals. There was Elemental Beauty, Green People, BM Beauty (rebranded as Beautiful Movements), Funky Fresh and Karma Naturals. Out of curiosity I had another browse of the web to see what else was out there and that is what lead me to My Beautiful Earth. MBE use 100% minerals and is free from nanos, preservatives, bismuth, ultramarines, kaolin, (except our concealers), talc, soya flour, rice flour, (except our sensitive formula), corn flour, artificial colours and no Animal Testing. The mineral powder foundations are available in four formulations – Normal, Healing, Sensitive & Rosacea and Pure Pearl Skin Renewal. If you are not keen on powder foundation there is a liquid version. 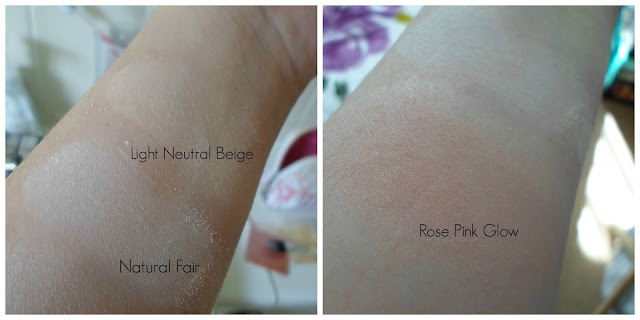 I ordered samples of the normal foundation in Light Honey Beige, Light Neutral Beige and Natural Fair, a finishing powder and a blush (Rose Pink Glow). The website is not the best for swatches so I chose from the descriptions. The colour range seems good and it looks to me like there is a colour for everyone starting from light (snow white) to dark (afro Caribbean). I found it very difficult to photograph swatches. My skin is pale and so are these products so they don't show up easily. The Finishing Powder blends into my skin and has a delicate shimmer. The blush is pigmented and gives a strong flush of colour to my cheeks, it's nice but not to my taste. I think out of the foundations I would chose Light Neutral Beige or Light Honey Beige as they both work well for my skin tone. I definitely would look to buy one of these when I use up my Everyday Minerals. Overall, I am impressed with quality and performance so I recommend you have a look at the website. i tried this brand a while ago but unfortunately the colours was all wrong :( too dark for my skin.